Indian foreign minister Salman Khurshid will pay an official visit to China from May 9 to 10 as a guest of Chinese foreign minister Wang Yi, the Chinese foreign ministry announced on Friday. Chinese leaders will meet with Khurshid and Wang Yi will hold talks with his Indian counterpart during Khurshid’s visit, ministry spokeswoman Hua Chunying said at a daily press briefing. “The two sides will exchange views in an in-depth way on bilateral relations and other issues of common concern,” said Hua. The spokeswoman hailed the development of China-India relations in recent years, highlighting their increasing political mutual trust, practical and fruitful cooperation and effective coordination in international and regional affairs. “We are ready to make joint efforts with the Indian side to advance the strategic cooperative partnership through the visit,” she said. According to Hua, China and India are committed to resolving differences including border issues through peaceful negotiations while advancing friendly cooperation between the two countries, to ensure that the differences will not affect bilateral ties. The two sides are communicating through related mechanisms and channels to solve incidents that happened in the border region, she said. 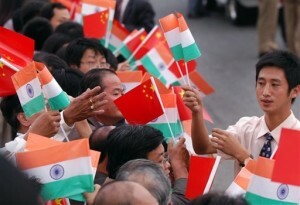 Indian media have reported that a standoff took place recently between Chinese and Indian troops along the western part of the two countries borderline. “The Chinese side is willing to work together with the Indian side to maintain peace and tranquility in the border region,” Hua said.